and covered them in fondant. I marked the cake with various grooves and holes to resemble flaws and nail holes in the bucket. I used food coloring gel and vodka to paint the bucket brown. When dried I used black fondant to create the straps on the bucket. Rock candy was used to resemble the ice and beer cans were cut and cleaned and the cut side was wrapped in tape and the cans were placed into the top of the cake. Join in and write your own page! It's easy to do. How? 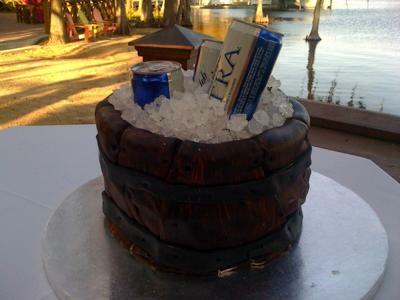 Simply click here to return to Beer Cakes.